Colonies of confdent penguins, evidencing no fear of Majestic mountains of ice form natural sculptures At the English station of Port Lockroy in Antarctica, humans, approached Tillberg in Antarctica. in Antarctica. Tillberg’s party went ashore and enjoyed displaying a direc- tional cone to avoid a potential traffc jam. 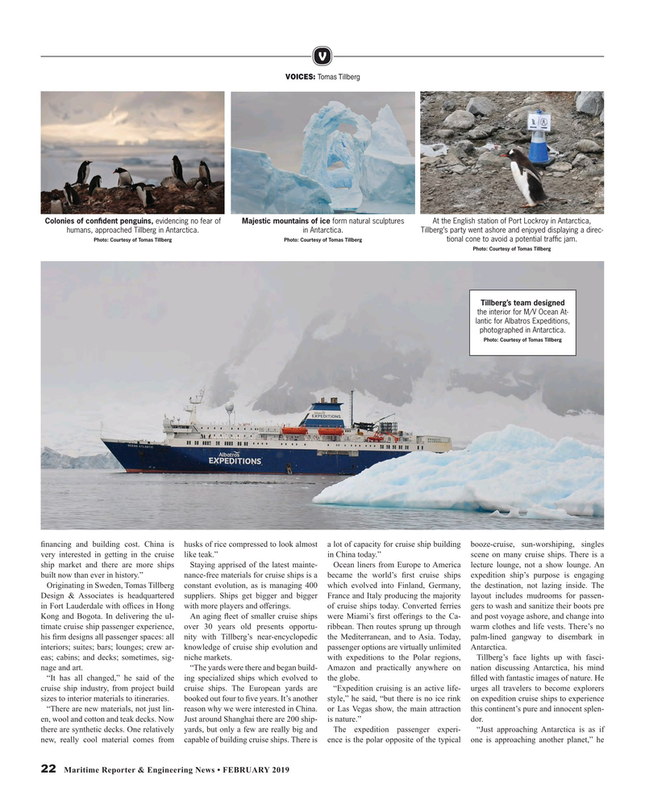 Tillberg’s team designed the interior for M/V Ocean At- lantic for Albatros Expeditions, photographed in Antarctica. Kong and Bogota. In delivering the ul- An aging feet of smaller cruise ships were Miami’s frst oferings to the Ca- and post voyage ashore, and change into timate cruise ship passenger experience, over 30 years old presents opportu- ribbean. Then routes sprung up through warm clothes and life vests. There’s no his frm designs all passenger spaces: all nity with Tillberg’s near-encyclopedic the Mediterranean, and to Asia. Today, palm-lined gangway to disembark in interiors; suites; bars; lounges; crew ar- knowledge of cruise ship evolution and passenger options are virtually unlimited Antarctica. eas; cabins; and decks; sometimes, sig- niche markets. with expeditions to the Polar regions, Tillberg’s face lights up with fasci- nage and art. “The yards were there and began build- Amazon and practically anywhere on nation discussing Antarctica, his mind “It has all changed,” he said of the ing specialized ships which evolved to the globe. flled with fantastic images of nature. He cruise ship industry, from project build cruise ships. The European yards are “Expedition cruising is an active life- urges all travelers to become explorers sizes to interior materials to itineraries. booked out four to fve years. It’s another style,” he said, “but there is no ice rink on expedition cruise ships to experience “There are new materials, not just lin- reason why we were interested in China. or Las Vegas show, the main attraction this continent’s pure and innocent splen- en, wool and cotton and teak decks. Now Just around Shanghai there are 200 ship- is nature.” dor.